A reader mailed me, criticizing my recent post Questioning Financial Astrology , in which I pointed out the problems with using longer term cycles. He is convinced that Jupiter cycle does work in the market and pointed to a post by Raymond Merriman, in which the Jupiter cycle gets mentioned. I have nothing against Merriman, like most astrologers he is probably trying hard to make it work, but basically he is blaming QE for his Jupiter cycle not working as expected. I think it would be more useful to consider the possibility that this Jupiter cycle doesn’t work. After all, even the best of methods only work 60% of the time, and even the best market “gurus” have it right about 60% of the time, as you can see here. So, Jupiter should be allowed some mishits as well, that’s OK. Trying to put blame on QE for some astrological cycle not working makes financial astrology look worse rather than better. But let’s have a look at the mentioned Jupiter cycle. Is it true that bull markets have a historic tendency of topping out when Jupiter transits between 23° Aries and 7° Taurus, followed by at least 20% declines? (and “normally” 48% according to this article)? We see a few tops falling within the sectors mentioned in the article (marked with a *), but 5 out of 18 is not statistically significant as that can easily be the result of normal random variation. These sectors appear to be just hand picked with the benefit of hindsight. None of the peaks fell in the mentioned sectors. A few are in the neighborhood, but that falls within normal expectation as well. All we can conclude is that there is no evidence for a Jupiter cycle at work as far as these bull market peaks go. If you randomly distribute 20 or 30 points on a circle then you will naturally get a few clusters where several points are close together. Here that’s the case in the sector 23 – 37 (23° Aries to 7° Taurus), but also at 180 – 190 (0° Libra to 10° Libra) and 300 – 324 (0° Aquarius to 24° Aquarius). That is no reason to expect a bull market peak whenever Jupiter transits these parts of the sky again. Out of 20 observed Jupiter cycles since 1790, the market has peaked (and subsequently declined 20% or more) 3 times when Jupiter passed between 23° Aries and 7° Taurus, and another 2 times the market peaked when Jupiter crossed the sector of 14-24° Gemini. But that also means the market did not peak and decline on the other 15 occasions when Jupiter crossed that part of the sky. That means QE is not to blame for this. The described Jupiter cycle has failed to produce expected bull market peaks on 15 earlier occasions, when there was no QE at all. It actually has only “worked” 5 times in 200 years. It is what it is. I think financial astrologers would do well to start discarding the cycles that clearly do not work in the market, and then perhaps they will be left with a few things that do work. Finding an edge in cycles is never easy. From time to time I get questions whether I use other planetary cycles besides the moon. Astrologers tell me to watch out for the next opposition of Jupiter to Saturn, or warn me that Uranus will be going retrograde next week. What about the Bradley indicator? Or the solar cycle? So let’s have a look at financial astrology and why I don’t use most of it. 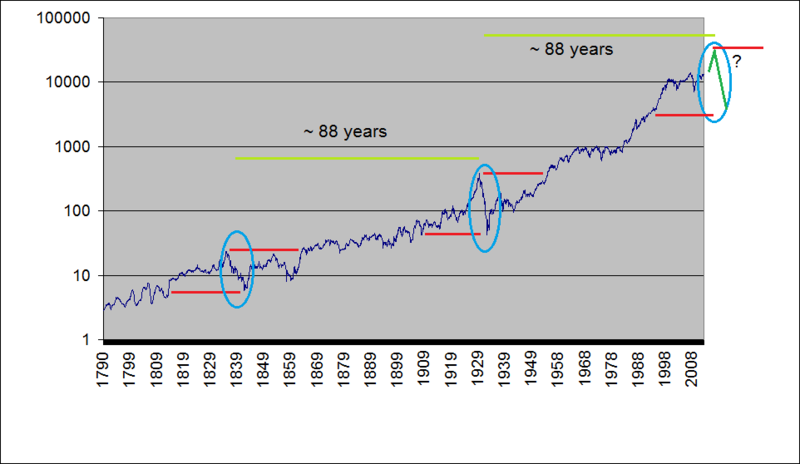 The problem with most planetary cycles is a simple one: we don’t have enough stock market history to reliably test any cycles that are longer than a year. For example, the planet Jupiter takes about 11 years to complete one cycle around the sun. Since the start of the New York Stock Exchange the planet Jupiter has completed only about 20 cycles. How much statistical confidence can we have in whatever conclusions we might derive from these 20 observed cycles? Maybe stocks have gone up when Jupiter was in Aries 14 times out of the observed 20. Should we then bet on the market going up again the next time Jupiter enters Aries? Well, there are 12 different star signs, so it is completely normal that stocks will have been a bit more “lucky” when Jupiter was in one of those signs (could be in Aries or any other one). So, the answer is no because this can easily be the product of random chance. Imagine you see a person toss a coin 10 times and get tails 7 times. Would you then bet that he will obtain tails again on his next try? The statistical significance is just too weak when we have 20 or less observed cases. But that’s not the only problem. Let’s say we continue to search and find some cycle that matches the stock market history in a way that is very unlikely to be the product of random variation, maybe at a 99% confidence level (see: p-value). That’s something we can use, right? We have now run into the “look-elsewhere effect“. We looked in all the different planets, we looked in combined cycles like Jupiter-Saturn conjunction cycle, we looked into different aspects, we looked into retrograde motion and heliocentric cycles, we looked into planetary nodes, and so on… until we found something that “worked”. But if we look in a few hundred methods and cycles of different lengths it is completely normal to find a few that stand out at the 99% confidence level. This is no different from continuing to toss coins until you manage to produce heads 7 times in a row. It will happen sooner or later. So, apart from the problem that we don’t have enough market history to test most planetary cycles for stock market effects, we also have so many different astronomical cycles and astrological methods to test that we are guaranteed to find a few that seem to work very well over a given test period for a given financial instrument. Are we then looking at the hand of luck from the look-elsewhere effect, or is it a genuine market cycle? In a second part I will present another take on long term planetary cycles, and a possible use. Retrograde Planets: How they effect? Markets continued to march higher last week, but turned down on Friday, which was the first day of our lunar Red period. It looks like there will be more selling today, as stock markets around the world react nervously to the news of the proposed bailout terms in Cyprus. That story sets a precedent and could have long term consequences. Who will want to keep any serious money in euros in EU banks, after seeing what happens overnight to our friends in Cyprus? The Nasdaq has reached the 3250 target we set a few weeks ago, and is bumping into overhead resistance. I am planning on sharing important charts and buy or sell setups on Twitter from time to time, so feel welcome to follow our account if you want to receive them. Where do we go next? A close below 3200 on Nasdaq would be a sign that the market has indeed turned down. But it remains to be seen how many buyers emerge after we get a few down days. Plenty of investors have missed out on the rally and are still waiting for a good chance to get in. If they outnumber the selling from investors who decide to take profits, then the market could turn back up quickly. For now, I would expect the market to drop to 3100 by April or May. But, we may not get that low if buyers appear quickly. Since we recommended to get out of gold in early February, gold stocks have taken a nosedive. The arc formation shows the selling climax that has taken place. Currently the XAU index seems to have found support around the 130 level, and downward pressure from the arc formation is behind us. Meanwhile the Earl2 indicator shows a broad bullish divergence and this means we can start doing some careful buying here. There could be one more leg down towards 120, so a good approach is to buy some now, and buy some more on the next pullback or on a break above 142. 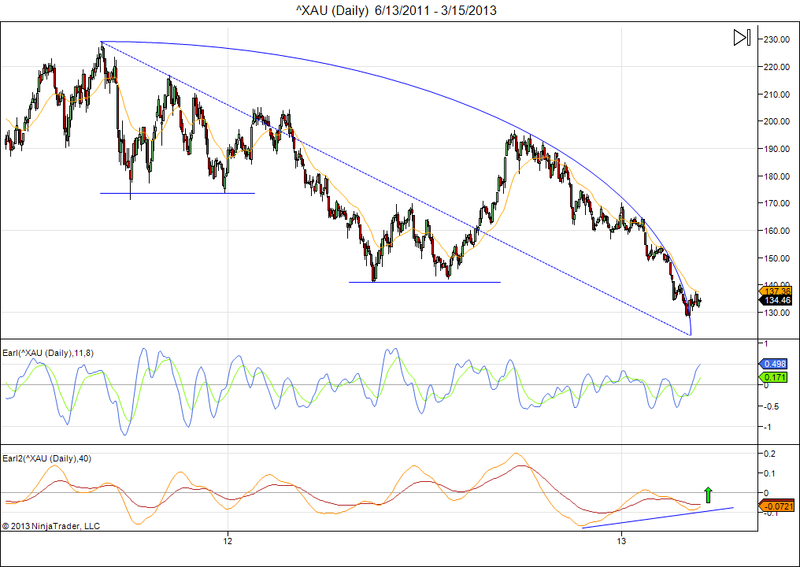 I would look for XAU to rise to 175 once it gets back above 142. So, that’s a nice 30% upside potential. Cyprus: Has the Next Phase of the Global Crisis Arrived? Markets have continued to push upwards, and are now testing all time highs. With a few more lunar Green period days to go, we could be recording new highs in the next couple of days, but time is starting to run out. 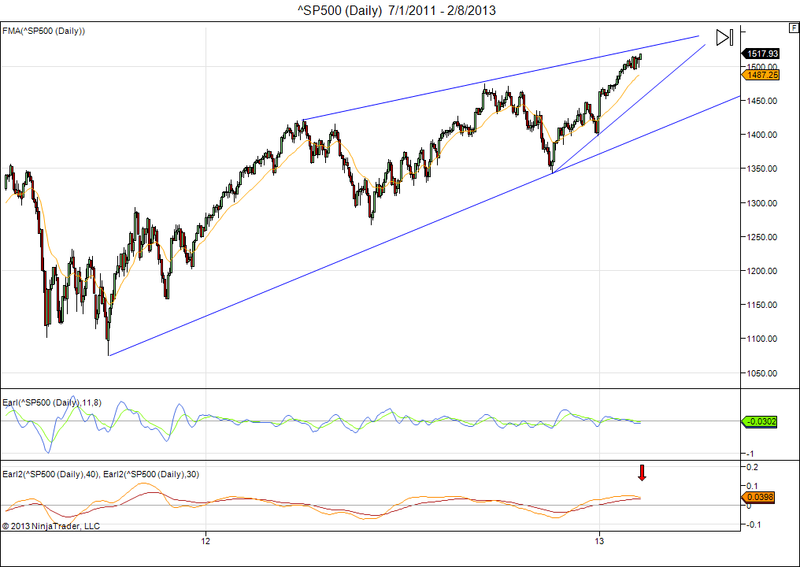 The ceiling of the upper trendline is around 1530 for the moment. We may or may not reach that level this week, but I think there will be another attempt in our next lunar Green period in early March. For now we should concentrate on the upcoming Red period. I would look for a setback to 1500 or just below it. A drop below 1470 would indicate that we have seen the highs for a while. 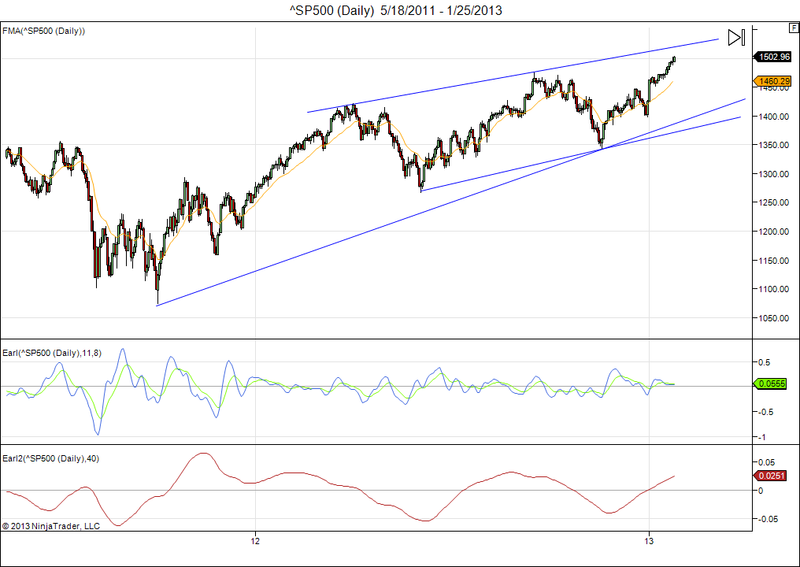 So, I would take some profits by mid-week, then buy back if the S&P is still above 1470 by the end of February. Notice how my Earl2 indicator is starting to turn down (red arrow). This indicator is often early, so it’s not a reason to panic immediately, but generally we have to be very careful (by keeping tighter stops) when the orange line crosses below the red line. Now that the markets we cover have reached important upside targets, it is a good moment to take a look at the longer term picture. 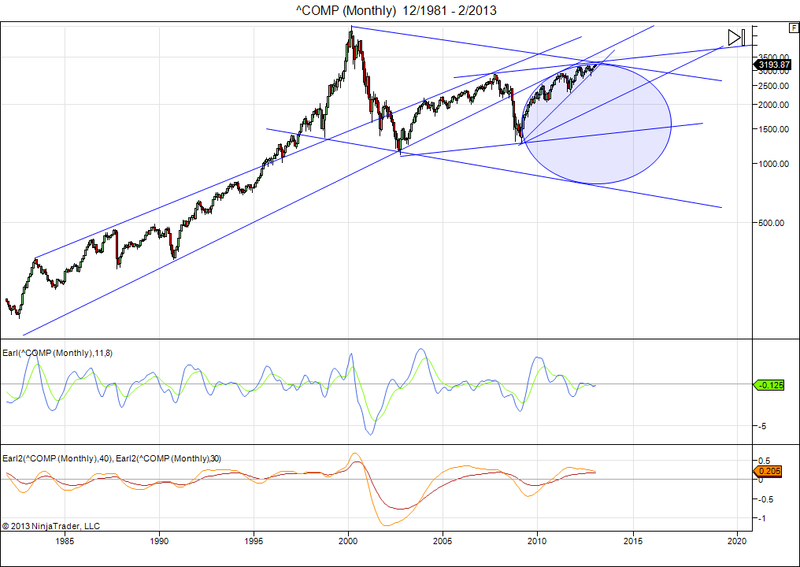 Here are some long term charts for the Nasdaq Composite index. Since the early 2009 bottom, the Nasdaq price action has been contained under a large arc formation, with multiple touches. This indicates a gradually weakening momentum. The arc formation converges around 3300 by the end of the year. 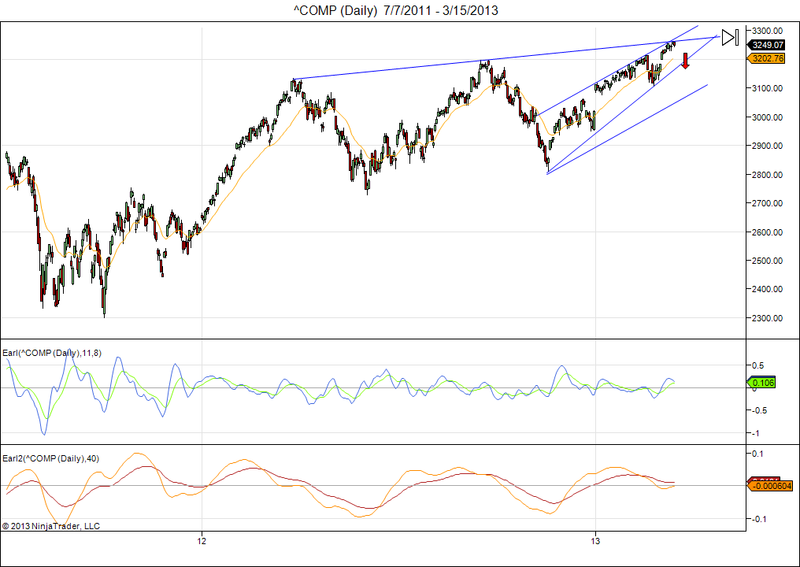 This tells us that the 3200-3300 area is going to offer tough resistance. 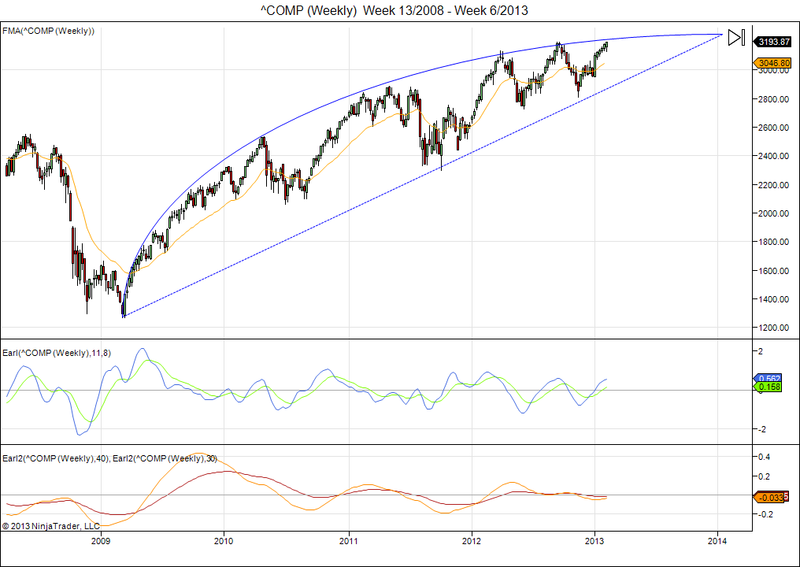 It also means that the market will probably make some important breakout, up or down, before the end of 2013. The price scale is logarithmic in this chart (log scale is better for very long term charts). The arc we saw in the weekly chart is now visible as the blue ellipse. Major trendlines put things into context. In 2008 the Nasdaq broke below a trendline that was in effect since the 1974 lows (not visible on this chart). The market came back to touch that line in 2010, but has not been able to get back above it. We can now see why the 3200-3300 level is so important. We may be in a uptrend channel since the 2002 lows, or in a ongoing downtrend since the 2000 peaks, in both cases the ceiling is currently positioned at 3300. The 3300 number can also be obtained in a few other ways. A doubling from the 2002 bottom is 2216 (2 x 1108). That level proved major resistance in 2004 and 2005, when it took 4 attempts and almost 2 years to finally break above that barrier. A tripling from the 2002 bottom would now give us 3324 (3 x 1108). The top in 2007 was at 2861, which was a fibonacci 2.618 times the 1108 low. The low in 2009 was at 1265.5. Applying the same ratio gives us 3313 (2.618 x 1265.5). We can see how 3300 is popping up in a number of ways. What to expect if this level continues to be a tough nut to crack? Then we would probably get a couple of pullbacks before finally making it above that level. We see how the price action since 2004 is nicely contained in parallel channels. A failure to get above 3300 would probably send us back to the support line of the middle trend channel, which is around 2800. In a worse case scenario the bottom trend line will come into play, where support would appear around 2100 (which would be a retest of the 2010 lows). 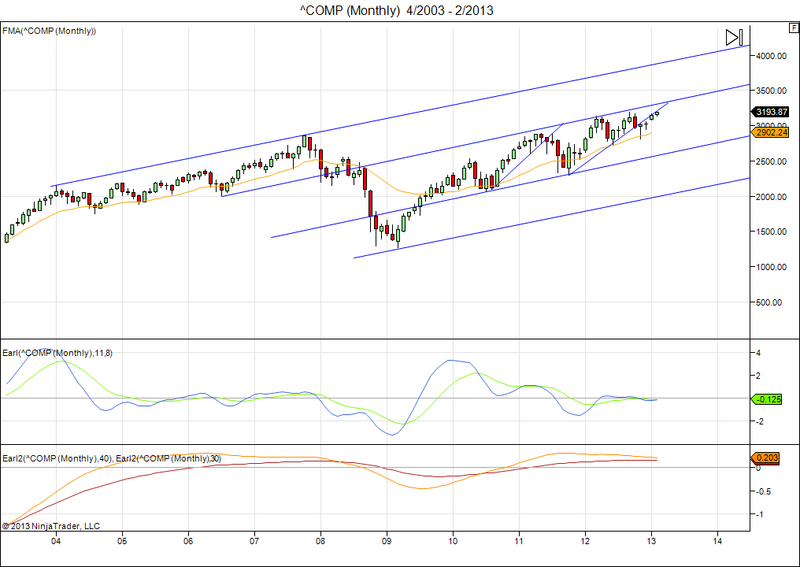 Time will tell when the Nasdaq breaks above 3300, but until that happens these charts can help us navigate the market. Stock markets have held steady, and several market indices have recorded all time highs. Still, most retail investors and people in the street are nowhere near optimistic about the economy. And that probably means there is more upside action to come. We have to bear in mind that the 2008 crisis and market decline is still not forgotten by most. After such a sharp decline, which shocked small investors, it usually takes many many years for these investors to come back. After the bottom in 1931, the market went up until 1937 even though the depression was ongoing. We have another week of lunar Red Period to go. The market is moving sideways, suggesting ongoing strength. This market has been lagging several other indices because Apple shares, the largest component in the Nasdaq, have been declining. 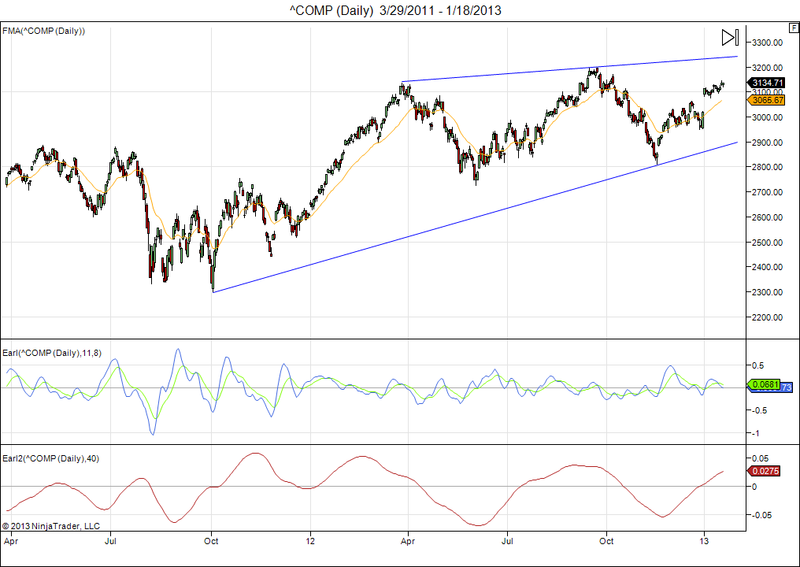 I think it will catch up and I would look for the Nasdaq to test and possibly exceed 3200 by early February. Last week I gave some information about the solar cycle. Or read it in the Scribd frame below. As always, your comments or questions are welcome.